Originally written in 2000 by Gary Schwitzer, founder and publisher of HealthNewsReview.org. Each of the “7 words you shouldn’t use…” in this article was suggested to him by patients he has interviewed through the years. We still see them used too much today. When I was a young reporter in Milwaukee, comedian George Carlin was arrested for publicly performing what was then becoming a popular part of his routine – “the seven words you can’t say on television.” Carlin ridiculed network censors by expounding on the attributes of the seven words he claimed could not get on the airwaves. Over a career (of now more than 40 years) in medical journalism and health care communications, I have developed my own list of taboo terms – all of which appear in print and on the public airwaves too frequently. 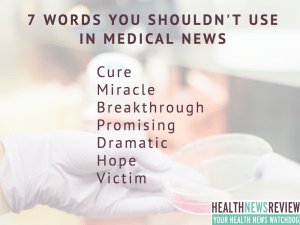 I offer my own list of the seven words you shouldn’t use in medical news and health care communications. I urge colleagues – both health care providers and professional communicators – to abandon their use for the sake of health consumers everywhere. I urge consumers of all health care information to be wary of these words because they mean different things to different audiences. Cure always has been one of the most loaded and ill-defined terms used in medicine or by the people who cover medicine as their beat. Does it mean absence of disease? Does it mean no recurrence of once-existing disease? Does it mean today, next week, 5 years, or a “normal life expectancy”? Does it mean the same thing to doctors as it does to those they treat? The term can be as meaningless as “expert,” which has been defined as anyone talking about anything more than 25 miles away from home. Some health care communicators and journalists love to slap the label of “breakthrough” on many advances in medicine. The use of breakthrough would be less offensive if the writers who use it also would agree to publish a long-term follow-up – a batting average – of how many “breakthroughs” actually panned out. A warning to health care consumers: be careful about putting too much stock in any claim made by medicine or the media if it uses the term “breakthrough.” True breakthroughs are better measured over years, not overnight. I’ve often wondered if the phrase “promising development,” used frequently in health care stories, shouldn’t be reserved for the business page. The word promising means “likely to be successful” or “to give a basis for expecting.” There is far too much uncertainty in medicine for this word to be applied loosely in the coverage of medicine. Unrealistic expectations are among the most dangerous forces that can exist in the doctor-patient relationship. Again, I urge journalists to document who is making the promise. It might come in handy, too, to publish the “batting average” requested above. Dramatic discoveries seem to occur in the medical media more often than even in our television soap operas. The ancient Greeks would remind us that drama could be both comic and tragic, as can the use of the word “dramatic” to inject hype into an otherwise important piece of research news. Veteran science writer Victor Cohn once chided medicine and the media by saying, “It seems like there’s only two types of medical news stories: new hope and no hope.” A woman struggling with cancer once told me she wished medical reporters would leave the word hope out of their reports and allow consumers to decide how much “hope” to assign to each story. People hate being called a victim. (Many even hate being called patients.) “Victim” should not be applied to someone with a disease or a health condition. It should be reserved for those health care consumers and consumers of news who are victimized by claims of cures, purveyors of false hope, or by those who promise dramatic, miraculous breakthroughs. Let’s drop these misleading and dangerous words from our dialogue about health care. Ill-defined, unfocused words can blur our vision as we gaze into the future of health care. This is a plea for a more disciplined selection of words by health care communicators, and for careful reading, listening and viewing by health care consumers. It’s a step we might all take in our pursuit of improved health care. If journalists parrot those terms when they hear them from physicians, editors should swoop in and edit their copy. News stories that cover clinical trials face a particular challenge with word choice. Trials are done to see if new ideas work and if they’re safe. So stories shouldn’t lead people to believe that the evidence of efficacy and safety is already in hand while the trials go on. “Therapeutic misconception” is a legal term referring to a situation in which people who agree to enroll in clinical trials believe there will be certain benefit from their participation in the experiment. Indeed, the experiment is not a treatment or a therapy, and journalists shouldn’t refer to it as such until the evidence is in. In the same way, it is troublesome to use the term “patients” to refer to people who agree to enroll in trials. Patients are people who get treatments or therapies. In the trial, these people are research subjects or participants (more polite terms than guinea pig). Journalists can spread a “therapeutic misconception” when they hype unproven ideas. For example, almost 1,000 stories were reported about a drug named pleconaril, which was being studied for the common cold. It was called a cure, a breakthrough, a miracle, a wonder drug, a super drug. That was when trials were under way. When the evidence was in, a Food and Drug Administration advisory committee rejected the drug by a vote of 15-0. Trials ended. The 1,000 stories can be put in the books as a waste of time. The drug never moved beyond “experiment” to “therapy” despite the glowing news coverage. Too often, the word is used as a crutch that allows media outlets to evade the responsibility of providing context. 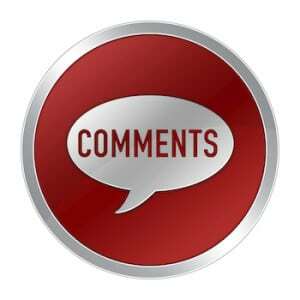 Certainly there are controversies in medicine, and all media outlets–including HealthNewsReview.org–employ the word “controversial” on occasion. But the word “controversial” should be used sparingly in health news, and always with context. And it should not be applied to settled science. The words used to describe health care and medical developments are important. Everything is relative. After my husband has an unsuccessful vasectomy reversal, we went to Cleveland Clinic and were told the surgeon there had a 60% success rate. We commented that the first surgeon touted a 75% success rate. The Cleveland Clinic surgeon said “I have done hundreds, and 75% success is not true”. We asked the first surgeon about his 75% success rate. He smirked and replied: “I did 4 and 3 worked”. Everything is relative. It is insightful that these 7 words appear routinely in ads sold by the CAM alternative to real doctors.